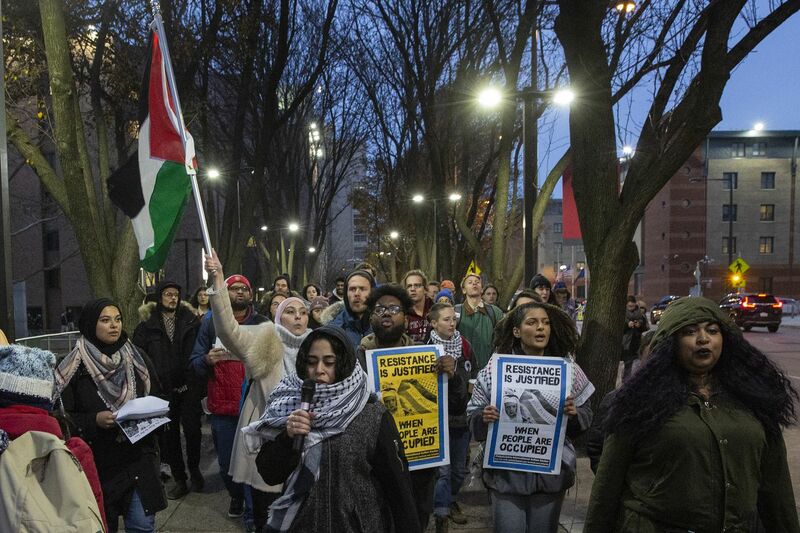 Temple students, alumni, and activists march at Temple University in support of Marc Lamont Hill, who was recently fired from CNN for comments he made in support of Palestine on Thursday. About 60 students at Temple University waved Palestinian flags and marched in support of professor Marc Lamont Hill on Thursday, as a group of Zionists with American and Israeli flags clamored for Temple to fire the embattled academic for controversial comments he made at the United Nations. In a speech delivered Nov. 28, Hill demanded a boycott of Israel and accused the Jewish state of rampant discrimination against Palestinians. He also voiced support for “a free Palestine from the river to the sea." Hill’s words were interpreted by some as anti-Semitic. “From the river to the sea” is often used by supporters of Palestinian causes to refer to the territory between the Jordan River and the Mediterranean Sea, the location of Israel and territories it occupies. Critics call the phrase coded language used by terror groups as a call for the obliteration of the State of Israel. Until last week, Hill was a frequent commentator on CNN. The cable news network swiftly severed ties with him following the speech. The professor of media studies and urban education in the Klein College of Media and Communication said his comments had been misconstrued. O’Connor, a high-profile Philadelphia lawyer, said that “people wanted to fire [Hill] right away” and that he had asked Temple’s legal staff “to look at what remedies we have.” Those comments prompted Thursday’s demonstrations. About 100 people -- the majority there to champion the professor -- faced off under Temple’s Bell Tower as the sun began to set and a chill set in. Susan Abulhawa, a Palestinian American writer and political activist, led the pro-Hill students in a chant of “From the river to the sea, Palestine will be free” before handing the microphone to students who declined to identify themselves. “Am Yisrael Chai,” the smaller group shouted. The Hebrew phrase loosely translates to “the nation of Israel lives.” Feldman and his group later launched into “The Star-Spangled Banner” in an attempt to drown out Hill’s supporters. Hayley Kanonji, 19, a media studies major at Temple and a Hill supporter, wrapped a keffiya loosely around her neck to keep out the cold. Hill, a former columnist for the Daily News, declined to comment. In a commentary piece published Monday in the Inquirer and Daily News, he expressed sorrow for his choice of words.